A highly integrated electronic text indexing and search system includes a new and useful updating tool. The integrated system encompasses a concept model, a query model, an enhanced markup tool, a user interface, and a search engine. A domain expert utilizes the integrated system to efficiently and effectively indexing electronic text for precise and fast retrieval by a search engine. The updating tool aids the indexing process as a consequence of changes in the query model, to an indexed document, or both. The updating tool comprises a document change tool and a query model change tool as well as an enhanced markup tool and an enhanced query model tool. The updating tool guides the domain expert by suggesting which indices need to be updated and flags index entries that need to be removed. FIELD OF THE INVENTION This invention relates generally to indexing electronic text and more particularly to a highly integrated electronic text indexing and search system having a new and useful updating tool for facilitating indexing of electronic text. BACKGROUND ART Modern computing and networking technology including the Internet makes it possible to organize, store and transfer large bodies of electronic data with minimal effort virtually anywhere in the world. With so much material so easily accessible, many have realized that the real issue is no longer getting enough information, but sorting out what is useful to them from vast quantities of irrelevant material. In a conventional search system, indexing, also known as marking up, the content of a document means that certain terms or keywords are selected or otherwise used to represent the content of the document. Online search engines often use these index terms to locate web-based resources. A typical online information retrieval system matches query terms with the index terms to identify relevant information. Unfortunately, when search terms occur in inappropriate contexts, queries to these systems often retrieve irrelevant material. Most users need to find answers to very specific questions, but this type of conventional search lacks precision. Information retrieval systems using statistical methods and natural language processing also suffer from inherent query ambiguity: these systems cannot identify the context of the query terms precisely. This need for precise and fast retrieval of information is even more pronounced in certain professions. For example, to provide optimal patient care, health-care professionals in clinical environments need to retrieve, in a timely fashion, accurate and up-to-date health-care and medical related information from a variety of online resources such as electronic textbooks, scientific journals, news, research papers, edited reviews, and medical databases. In recent years, researchers have developed a variety of systems to improve the indexing and searching of these electronic resources. The primary goal is to increase research precision/specificity (i.e., fraction of relevant search hits/results to all hits) without severely reducing recall/sensitivity (i.e., fraction of relevant hits to all possible relevant hits in the database). For example, a content-based indexing system is disclosed in "MYCIN II: Design and Implementation of a Therapy Reference with Complex Content-Based Indexing" Proc Amia Symp 1998: 175-179, by Kim et al . Co-developed by co-inventors Fagan and Berrios, MYCIN II is a prototype information retrieval (IR) system capable of searching content-based markup in an electronic textbook on infectious disease. Users select a query from a pre-determined set of query templates in the query model. The selected query is then passed to a search engine for processing. S99-186/CIP/PCT 2 expert, to properly generate concepts, markup medical text based on these concepts, and generate query templates. Accordingly, it is no surprise that, in this system, a significant amount of manual work was required by the domain experts to generate the ontology of concepts in the concept model and the set of questions in the query model. In addition, because the tools such as the markup tool and the search engine in the MYCIN II system were developed independently, there was minimal integration amongst them. This resulted in having the domain experts repeating several common tasks when using these tools. We address the aforementioned deficiencies with a highly integrated system and method that significantly increases search precision while reducing the amount of manual work, repeated common tasks, time, and cost necessary to markup/index a file of electronic text for searching. There is a continuing need and desire to correspondingly and appropriately update the indices whenever a previously indexed document and/or the query model changes . S99-186/CIP/PCT 3 search engine. Based on a user query submitted via the user interface, the search engine retrieves relevant information, e.g., portions of an indexed document, from a set of documents indexed by the domain experts. The retrieved information provides more precise answers to queries and thus is more useful to users. The updating tool aids the indexing process as a consequence of changes involving the query model and/or the indexed document. For example, the updating tool automatically compares newly updated and previously indexed documents and generates indices that need to be correspondingly updated. It intelligently guides the domain expert by suggesting which indices need to be updated and flags index entries that need to be removed. S99-186/CIP/PCT 4 or otherwise identify text elements, such as a chapter, a section, a paragraph, a sentence, or a word, that need to be updated. For each such element, a domain expert selects the corresponding indices and corrects them. Because the domain expert only needs to index/re-index highlighted portions of the text and does not have to re-index the entire document, the time and hence cost necessary to index a previously indexed document that is affected by changes/updates to the original document is greatly reduced. In a similar fashion, when the query model is changed or modified, e.g., by a domain expert, the query model change tool, which comprises an enhanced query model tool, logs all the changes to a log file. The integrated electronic text indexing and search system takes the log file and highlights or otherwise identifies, via an indexing interface of the enhanced markup tool, sections of documents where the existing text has previously been indexed with a query that has changed. Furthermore, the enhanced markup tools shows how the query has been changed to facilitate re-indexing the section of text, if necessary. FIG. 1 is a diagram illustrating an integrated electronic text indexing and search system where the present invention is embodied. FIG. 1A schematically shows components (a text analyzer and an indexing interface) of the markup tool shown in FIG. 1. FIG. 2 illustrates the concept model tool of FIG. 1. FIG. 3 illustrates the query model tool of FIG. 1. FIG. 4 illustrates the markup tool, via the indexing interface, of FIG. 1. S99-186/CIP/PCT FIG. 5 is a top-level flow diagram illustrating, according to an embodiment of the present invention, steps involved in indexing an original document and preparing for updating indices due to changes made to the original document. FIG. 5A illustrates the details of the preprocessing step shown in FIG. 5. FIG. 6 is a detailed flow diagram illustrating the document change tool concept according to an embodiment of the present invention. FIG. 7 is a flow diagram illustrating the query model change tool concept according to an embodiment of the present invention. FIG. 8 illustrates the improved indexing interface of the enhanced markup tool having integrated with results generated by the document change tool according to an embodiment of the present invention. FIG. 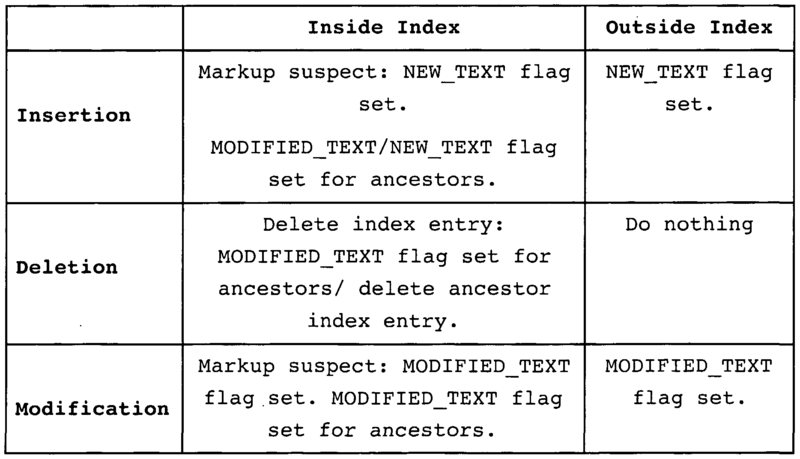 9 illustrates the improved indexing interface of the enhanced markup tool having integrated with results generated by the query model change tool according to an embodiment of the present invention. S99-186/CIP/PCT 6 integrated electronic text indexing and search system. As shown in FIG. 1, the integrated system encompasses a concept model 100, a query model 102, a markup tool 104, a user interface 110, and a search engine 112. Each of these tools is first introduced with reference to FIGS. 1-4. The integration thereof is next discussed. The updating tool is then described in detail with reference to FIGS. 5-9. In an exemplary embodiment, the markup tool 104 is composed of two modules as shown in FIG. 1A. The text analyzer 104a performs preparatory steps such as converting the input document format into one that is compatible with the system, identifying all the paragraphs and sentences in the input document, inserting corresponding identifiers into the document, and conducts syntactic and semantic analysis, including looking up phrases in thesaurus, of the text portions of the document. These preparatory steps, which will be further described with reference to FIG. 5A, are necessary for the document to be used in the indexing interface 104b. The indexing interface 104b guides indexers, i.e., domain experts, by displaying the document to be indexed, storing and retrieving all indices of the document, and suggesting index choices. As shown in FIG. 2, the concept model 100 defines a set of concept-value pairs. Concepts 201 are variables that take on as their values one of the listed values 202 for each concept. There are separate values 202 listed for each concept 201. In an example, the concept model for the medical domain can be based on the Unified Medical Language System® semantic network. S99-186/CIP/PCT 7 expert in terms of a subset of the concept-value pairs in the concept model. Each query has one or more replaceable parameters that correspond one-to-one with concepts in the concept model. The current question in a query model is displayed in section 302. Each existing query is displayed, e.g., via a box 304, to allow the domain expert to edit the query. Each query is also displayed, e.g., via one or more menus 306, to show the domain expert what the user-selectable values are. The domain expert can also add queries to the query model through section 308. The domain expert constructs the queries by entering free text in boxes such as 314, and designating the text with, e.g., the "Insert Text" button 316. This indicates to the query model tool that the text entered in box 314 is "fixed" and not user-selectable. For the selectable text menus 306, the domain expert can choose one of the enumerated concepts displayed in the menus 318 and 320. The enumerated concepts in the menus 318 and 320 come respectively from the concept model 100 and from "dynamically-valued concepts". The dynamically-valued concepts are concepts that are found in the electronic text by comparing each word in the text to a semantic dictionary such as the UMLS knowledge base. The domain expert continues to construct using the combination of fixed text, via box 314, and concepts in the menus 318 and 320 until the query is complete . S99-186/CIP/PCT 8 queries in the query model. The domain expert has to choose from the list of allowable values shown in section 408 to assign markup tags to the sentence 406. He also has the ability to add values from within the markup tool. This is done in box 410 where the domain expert can enter a new concept. The present assigned markup tag for the sentence 406, if any, is shown in section 412. In section 412, the domain expert can add, replace, or delete assignments of markup tags to a sentence. A markup tag can also contain data that specify which query is associated with this assigned markup tag. The assigned markup tags can be stored directly in the electronic text or can be stored in record format in a markup instance database. Section 414 shows the categories of queries, e.g., drug efficacy, dosing, duration, route, susceptibility, adverse effects, drug properties, and vaccine, that can be selected to perform the markup. The categories of queries are constructed with the query model tool, i.e., they are modifiable and are not fixed. Referring back to FIG. 1, the user query interface 110 presents the queries and restrictions that an end user uses to formulate his query. The user then submits a formulated query via the user query interface 110 to the search engine 112. The user query interface 110 can be a computer program that calls a function to select the concept-values to be submitted to the search engine 112. Instead of the user query interface 110, an external input 120 such as another computer program can submit a query to the search engine 112. S99-186/CIP/PCT 9 where the relevant information is found and an option to output the query to an external database such as Medline to perform a guided Medline Search 116. The search engine 112 can also output the search results, the concept-values assigned to the search results, and/or the original concept- values submitted by the query, to an external electronic resource 118. The integration of the concept model 100, the markup tool 104, and the query model 102 in the electronic text indexing and search system ensures that the queries in the query model 102 and the markup tags assigned by the markup tool 104 integrates the concepts and values from the concept model 100. This increases the ease of marking up electronic text for the domain expert because he does not have to manually keep track of all the available concepts and values. In this system, each query constructed by the domain expert becomes a template for many possible queries that can be formed by an end user as he chooses particular values for each concept from a list or menu in the user query interface. On the other hand, the query model tool dynamically updates the allowable concepts in the query model 102 when the domain expert modifies the set of concepts in the concept model 100. The query model tool, which can automatically generate the user query interface 110, may be implemented with HTML forms and controlled with Common Gateway Interface (CGI) scripts written in PERL or Java programming languages . S99-186/CIP/PCT 10 data in the concept model 100. Further, the set of queries in the query model 102 can be stored in the concept model 100, thereby merging the query model 102 and the concept model 100. Changes to the concept model 100 will appear in the markup tool 104 and the query model tool. Similarly, as the query model 102 is updated, concepts are automatically updated to keep the concept-values used in the markup tool 104 consistent with the concept-values used in the query model 102. The queries and the assigned markup tags integrate concept-values from the concept model 100. The integration of the concept model 100 with the markup tool 104 and the query model tool makes indexing electronic textbooks much quicker with less effort. Unlike the conventional markup tool, not all the concept- values in the concept model 100 are available to the domain expert in the markup tool 104. The domain expert has to first create a set of queries using the query model tool to determine what the subset of the concept-values will be, and can only assign markup tags using this subset of concept- values. This prevents the problem of the markup tool 104 presenting a very long list of concepts-values encompassing all the concept-values in the concept model 100 which would become unmanageable by the domain expert. S99-186/CIP/PCT 11 query model 102 is used to generate a set of allowable concept-values available to the domain expert for the assignment of markup tags to the electronic text in the markup tool 104. The completed marked up text is presented in 108. The aforementioned integration is transparent to end users of the integrated electronic text indexing and search system. An end user, via the user query interface 110, uses the query templates constructed by the domain expert in the query model 102 to formulate a query. The user-formulated query is submitted, via the user query interface 110, to the search engine 112. The search engine 112 uses the concept-values in the submitted query to match against the assigned markup tags. The search engine 112 searches only the assigned markup tags and not all of the text and therefore performs the search very quickly. The integrated electronic text indexing and search system is designed to "ask questions first." That is, the system enables the domain expert, while marking up a piece of text, e.g., a sentence, to answer the question, "what query is this sentence answering?" A piece of text that answers the question, e.g., "drug causes disease", can thus be differentiated and distinguished from another piece of text that answers the question, "drug treats disease." This "question-based" design allows for a more structured and powerful text indexing system. This system generates textbook indices that are more detailed and more useful to users. It requires domain dependent query model and concept model, as well as a domain independent document model, based on the explicit and implicit structure of HTML documents, to provide some of the knowledge/expertise required to create such complex indices. S99-186/CIP/PCT 12 Accordingly, whenever the document changes the indices would need to be updated correspondingly and appropriately. The integrated query-based indexing and retrieval system is affected by two different kinds of changes: document changes and query model changes. Both kinds of changes must be considered and the indices thoughtfully updated. As discussed before, indexing documents for fast and precise information retrieval is a very time-consuming and labor-intensive process. Therefore, an underlying goal would be to retain as much of the old indices as possible, i.e., only indices that are affected by the changes should be updated. By reusing as much knowledge represented in the indices as possible, time and hence cost needed for the updating can be minimized. According to an aspect of the invention, the updating tool has a document change tool and a query model change tool for updating indices of marked-up documents that are affected by a document change, a query model change, or both. The updating tool further comprises an enhanced markup tool with an improved indexing interface. The document change tool is described hereinafter with reference to FIGS. 5-6 and the query model change tool is described hereinafter with reference to FIG. 7. S99-186/CIP/PCT 13 HTML, i.e., regular HTML formatting that corresponds to XML structuring conventions. XHTML is a format that is compatible with the integrated electronic text indexing and search system shown in FIG. 1. Referring back to FIG. 5, the preprocessed XHTML document from step 502 is then marked up by a domain expert in step 503 to generate a marked-up XHTML document 504. 512, which is essentially the same as step 502a, the modified/updated HTML document 511 is converted via a processing tool into an XHTML document 513. In an exemplary embodiment, to retain as much of the old indices as possible, the document change tool of the present invention takes the previously indexed XHTML document 504 and the modified, unmarked XHTML document 513 to generate a composite XHTML document with changes highlighted or otherwise identified so that it would be apparent to a domain expert that only indices affected by the changes should be updated. S99-186/CIP/PCT 14 document 504 and the modified, unmarked XHTML document 513. In some cases, the composite file 621 may need to be converted via a processing tool such as one described in step 512 into a valid XHTML document that is compatible with the underlying system. In the composite file 621, text that was in the document 504 but not in the document 513 (e.g., the text that was deleted in the editing process) is identified as deleted text. In a specific implementation, such deleted text is placed in the composite file 621 between surrounding HTML <span> tags and an attribute is added thereto to identify the deleted text. Similarly, text that was not in the document 504 but in the document 513 (e.g., text added via an editing process or entity 500) is identified in the composite file 621 as new text. In a specific implementation, such new text is placed between surrounding HTML <span> tags and an attribute is added thereto to identify the new text. An index retrieval tool, which may be a part of the text change tool 640, puts the index information into the composite file 621. The index information may be retrieved from an index database 600. The text change tool 640 takes the composite file 621 as input and accordingly updates the index database 600 to reflect changes highlighted or identified in the composite file 621, particularly concentrating on whether an insertion, deletion, or change has taken place. S99-186/CIP/PCT 15 can then display to the domain experts the insertions and changes as they re-mark up the updated document. Table 1 shows how document changes are interpreted by the system. Whenever there is an insertion or modification inside a portion of the text (i.e., an HTML text element) that was previously indexed by an indexer, that portion is highlighted as "index (now) suspect". If an indexed text element is deleted, the corresponding index is automatically deleted from the database 600. A database column, e.g., a column called ERROR_TEXT, holds the change flags for every instance of indexing in the system. These flags can have the following values: NEW_TEXT: identifies newly inserted text. M0DIFIED_ TEXT: identifies text that has been modified. The text change tool operations, i.e., 'Insertion', 'Deletion' and 'Modification', are defined at the HTML element-level . 1. Removing from the composite file 621 text that has been identified as deleted. 2. Retaining text that has been identified as new. 3. Assigning new domain identifiers (i.e., a new domain identification number - DOMID) to newly added indexable elements in the text. An indexable element is a complete sentence or a paragraph, as opposed to a new word inside an old sentence. This step essentially corresponds to step 502b of FIG. 5A. 4. Stripping away additional tags and attributes added by the XHTML compare tool 620 to generate the valid composite XHTML document with DOMIDs 661. The enhanced markup tool 680 performs semantic analysis, which is essentially the same as step 502c of FIG. 5A, on the valid composite XHTML document with DOMIDs 661 to generate a final valid composite XHTML document. The enhanced markup tool 680 highlights or otherwise identifies, according to indexing information retrieved from the index database 600, where text has been added, deleted, replaced, or otherwise modified/updated in the final valid composite XHTML document. S99-186/CIP/PCT 17 writes the changes specified by the domain expert to the index database 600, i.e., once the corrections have been made, the index database is appropriately updated. Because the domain expert only needs attend to highlighted portions of the text and does not have to re-marking up the entire document, the time and hence cost necessary to index a previously indexed document that is affected by changes/updates to the original document is greatly reduced. FIG. 7 is a flow diagram illustrating the query model change tool concept according to an embodiment of the present invention. The query model change tool comprises an enhanced query model tool 710. In step 720, the enhanced query model tool 710 generates an updated query model 702 and a change log file 722. More specifically, when the query model 102 is modified, e.g., by a domain expert, via the enhanced query model tool 710, the tool 710 logs to the change log file 722 any and all changes either to the text portions or to the concept-values that compose each query. That is, the query model tool 710 is enhanced to allow the logging of actions that have taken place as queries are modified to add or remove new concepts or to alter text portions of the queries. The query model tool 710 also logs any queries that have been deleted, so that the relevant markup may be made obsolete. S99-186/CIP/PCT 18 the changes are to the corresponding query templates. That is, the enhanced markup tool highlights the sentence or paragraphs that have been marked up with a query model that has changed and also displays information about how the query model has changed. Again, since the domain expert only has to modify the document indices that are affected by changes to the queries in the query model, the time and resources required for updating the indexed document are minimized, resulting an even more efficient and effective integrated electronic text indexing and search system. FIG. 8 illustrates, according to an embodiment of the present invention, an improved indexing interface of the enhanced markup tool 680 incorporating outputs generated by the document change tool. In FIG. 8, like sections and elements are denoted with like reference numbers as shown in FIG. 4. A sentence 806 in a paragraph to be assigned markup tags is shown in section 802. The sentence 806 has been modified by an author and is highlighted according to the legend, New Text, Modified Text, Ontology Change, in section 816 to identify that it has been changed and thus alerts the domain expert that the markup specified in section 812 may be wrong. In section 812, the domain expert can add, replace, or delete assignments of markup tags to a sentence. In this case, the markup shown in section 412 of FIG. 4 is still valid, but a new markup 818 is shown in section 812 to acknowledge that a new treatment (Drug: MS731) 820 has been added to the sentence 806. Also shown in section 802, a new sentence 804 was added by the author and is highlighted according to the legend in section 816. The highlighted new sentence 804 alerts the domain expert that new markup tags may need to be added. S99-186/CIP/PCT 19 Section 808 shows the set of allowable concepts and values from where the domain expert can choose to assign markup tags to the sentence 804. Box 810 is essentially the same as box 410 of FIG. 4 where the domain expert can enter a new concept from within the enhanced markup tool 680. Section 414 shows the categories of queries that can be selected to perform the markup . FIG. 9 illustrates, according to an embodiment of the present invention, an improved indexing interface of the enhanced markup tool 680 incorporating outputs generated by the query change tool. For the sake of clarity, in this example, it is assumed that the original text of the indexed document has not been changed or modified as shown in FIG. 4. In FIG. 9, like sections and elements are denoted with like reference numbers as in shown in FIG. 4. In this example, sentence 906 shown in section 902 has been marked with a query on "route of administration" shown in section 908. However, sentence 906 is highlighted according to the legend in section 916 to identify that the corresponding query description has been changed, i.e., a change affecting this already indexed sentence was made to the query model, thereby suggesting to the domain expert that the corresponding markup may need to be modified. In section 920, the output of the query model change tool is displayed, which identifies a changed text string 922, a changed concept 924, and an inserted concept 926 shown in section 908. The domain expert modifies the indices of the indexed document by responding to comments displayed in section 920. Box 910 is essentially the same as box 410 of FIG. 4 where the domain expert can enter a new concept from within the enhanced markup tool 680. Section 912 differs from section 412 of FIG. 4 in that an extra field has been marked up that was added in response to the query change shown in section 908. Section 414 is the same as shown in FIG. 4. S99-186/CIP/PCT 20 A highly integrated electronic text indexing and search system has been described in detail. The system has an updating tool comprising the document change tool and the query model change tool. This updating tool makes the integrated electronic text indexing and search system very flexible and convenient to use. More importantly, the consistency of the system after a document change, a query model change, or both, is maintained with this updating tool. It should be understood that the present invention is not limited to or defined by what is shown or discussed herein; rather, the invention may be practiced with the specific details herein omitted or altered. The drawings, description and discussion herein illustrate technologies related to the invention, show examples of the invention and provide examples of using the invention. Known methods, procedures, systems, and components may be discussed or illustrated without giving details, so to avoid obscuring the principles of the invention. It will be clear to one skilled in the art that the above embodiments may be altered in many ways without departing from the scope of the invention. For example, to keep pace with the increasing trend of information technology, several tools of the integrated electronic text indexing and search system, including the user query interface and search interface, may be implemented in portable information appliances and devices, e.g. handheld personal computing devices, laptop, personal digital assistant, etc. In addition to making the system convenient to use, such implementation is anticipated to increase the efficiency and productivity of the user. S99-186/CIP/PCT 21 the user's ability to find relevant information from other sources. This also removes psychological barrier that the user faces if there is no provision of external search. Moreover, although the change log file 722 is an XML file in this embodiment, it could be any persistent data repository, such as a record-based "flat" file or a relational database. Also, as implemented in this embodiment, the system uses the domain identification number; however, the log file changes can be matched to the markup instances by other methods or implementations, for example, generating a unique identification using a hash function, or by matching the old query text using a direct string comparison. 1. An integrated electronic text indexing and search system comprising: a concept model defining a set of concept-value pairs modifiable by a domain expert; a query model characterized as a set of queries constructed by the domain expert in terms of a subset of the set of concept-value pairs; a markup tool for generating a set of allowable concept- value pairs based on the subset and for assigning the allowable concept-value pairs via markup tags to sentences or a piece of electronic text; and an updating tool for updating indices of a previously marked-up document that is affected by a change to the sentences or the piece of electronic text, a change to the query model, or both. 2. The system of claim 1, wherein the updating tool comprises a document change tool, a query model change tool, and an enhanced markup tool comprising a text analyzer and an indexing interface. 3. The system of claim 2, wherein the document change tool comprises : a document compare tool for comparing the previously marked-up document and an unmarked document containing changes to the sentences or the piece of electronic text to generate a composite file thereof; and a text change tool for identifying paragraphs and sentences in the composite file, placing corresponding indexing information into the composite file, and modifying an index database according to the indexing information. S99-186/CIP/PCT 23 instance of indices in the system, the change flags having at least a first value for identifying newly inserted text and a second value for identifying text that has been modified. 5. The system of claim 4, wherein the text change tool modifies the index database by marking up suspect index or deleting index and correspondingly setting the first value, setting the second value, or doing nothing. 6. The system of claim 3, wherein the document change tool further comprises: a processing tool for converting the composite file into a format that is compatible with the system; and an index retrieval tool for retrieving indexing information to place in the composite file. 7. The system of claim 2, wherein the query model change tool comprises an enhanced query model tool and a log file, the enhanced query model tool logging to the log file actions that are taken as the set of queries are modified to add or remove new concept-value pairs or to change the scope of a particular concept. 8. The system of claim 2, wherein the enhanced markup tool displays the previously marked-up document and highlights the change to the sentences or the piece of electronic text, the change to the query model, or both, thus enabling the domain expert to marking up only indices of the previously marked-up document that are affected thereby. S99-186/CIP/PCT 24 allowable concept-value pairs based on the subset and for assigning the allowable concept-value pairs via markup tags to sentences or a piece of electronic text, the method comprising the step of: updating indices of a previously marked-up document that is affected by a change to the sentences or the piece of electronic text, a change to the query model, or both. 10. The method according to claim 9, further comprising the steps of: comparing the previously marked-up document and an unmarked document containing changes to the sentences or the piece of electronic text; generating a composite file containing content of the previously marked-up document with the changes to the sentences or the piece of electronic text identified; placing into the composite file indexing information that corresponds to the changes to the sentences or the piece of electronic text; modifying an index database in accordance with the indexing information; processing and analyzing the composite file to generate a properly indexed file; displaying the properly indexed file with the changes to the sentences or the piece of electronic text highlighted; and updating only indices of the highlighted sentences or the highlighted piece of electronic text. S99-186/CIP/PCT 25 text is highlighted according to the log file to identify that a corresponding query description has been changed in the query model; and updating only indices of the highlighted sentences or the highlighted piece of electronic text. 12. The method according to claim 11, wherein the displaying step further comprises the step of: identifying a changed text string, a changed concept, and an inserted concept. S99-186/CIP/PCT 26 computer program means for displaying in an indexing interface the properly indexed file and highlighting the changes to the sentences or the piece of electronic text. 14. The computer readable medium of claim 13, further comprising: computer program means for logging actions that are taken as the set of queries are modified to add or remove new concept-value pairs or to change the scope of a particular concept; computer program means for displaying in an indexing interface the sentences or the piece of electronic text, the set of modified queries, and the corresponding actions; and computer program means for highlighting the sentences or the piece of electronic text according to the log file. 15. The computer readable medium of claim 13, further comprising: computer program means for identifying in an indexing interface a changed text string, a changed concept, and an inserted concept. EP1826692A3 (en) * 2006-02-22 2009-03-25 Copernic Technologies, Inc. Query correction using indexed content on a desktop indexer program.